See what we accomplished in 2003...Click Here! Shooting the grade for the building lot, where the main house will someday go. The grade is about 20%. Extending our driveway to a loop. The main house will go downhill of the equipment in the first picture. 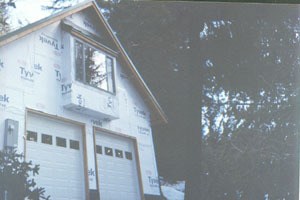 The carriage house we will build this season goes uphill from the drive in the second picture. The third picture shows the approach, carriage house to be built to the left side of the picture. The fourth picture shows the view downhill, past the well casing, towards the main lot and the fjord beyond. An interesting method of limbing trees, to bring the loop up and around. OSHA is not prevalent in Alaska. Breaking ground, and uncovering "the nugget." We uncover "son of nugget." Relatively easy access to the water, from the main lot, on off days we constructed a fairly crude stairway from driftwood and timbers found on the rocky beach. The "hole where the money went" and our imbricated pile of clay. Note the horizons in the cut, glacial clay quite abundant beneath soil. Most lots have very thin soil horizons, and require the blasting of bedrock. The footing and first concrete poured. We have a beachhead! 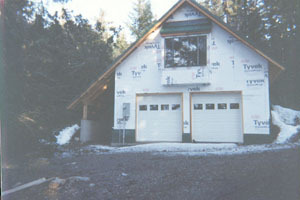 Garage dimensions are 25 x 28 with a side entrance. Dinner with friends on the deck of our little rental cabin. View from the deck, and views of Rainbow Glacier taken at the mouth of Letnikof Cove. A trip up the road into British Colombia to enjoy the sub-alpine tundra. Returning, we find forms set for the stem walls. 35 yards of concrete is poured. And I end up with something that looks like a cross between a bunker and the beginning of a mall. I had to get a picture of the excavator parked in my "garage." We are laying in drain tile around the edge of the building. Building a fire pit on our "beach." 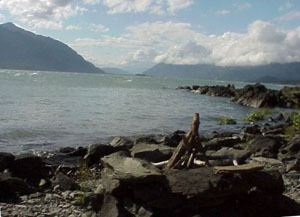 Tides can be up to 18 feet. The wood was washed out before we even had our first fire. 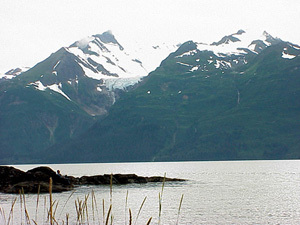 The last picture is looking up the inlet to the mouth of the Chilkoot River and British Colombia in the background. Given the huge volume of glacial melt coming from the river, the water here is fairly fresh, despite the tides. The southern point of our beach...notice the comfy stone seat with the grand backdrop. The building begins, with a first wall, erected for an electrical box the make the rest of the work go fast. Carolyn is caught cutting down a tree. This is worth documenting! The framing continues. Lots of string set at the outset guarantees square corners. 14" BCIs mean a solid, quiet floor, with no support posts in the garage below. Rafters are 2 x 12 x 20 rough cut, dimensional spruce...plenty strong, plenty heavy. There wasn't much tongue weight on that trailer! The shed roof is added for the side entrance to the garage. Standing seam metal roof has no exposed fasteners. 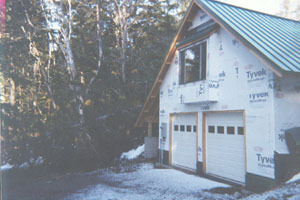 The 10-12 pitch roof will easily shed snow. This was as we left the project, four weeks after ground breaking. The last roof panel was secured a few hours before we left for home. 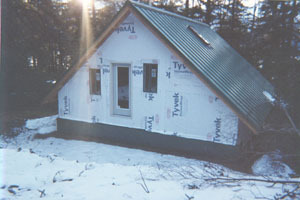 In our absence, our crew finished the doors, windows, and temporary siding. The hole was also backfilled. If you click on the thumbnails, look closely and you will see a rather large tree that fell right next to the house, narrowly missing it. About six chords of firewood lay next to the carriage house now, conveniently located for easy stacking!